This review is about another toy purchased by a crazy uncle in hopes of annoying the parents just a little bit. This was a gift during my son’s first birthday. 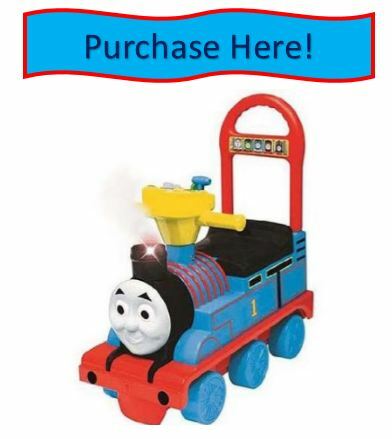 Just for clarification sake, I’m not sure if I should call this a Thomas the Train Push toy, or a Thomas the Train riding toy or if the Thomas the Train Sit and Push Toy label is officially correct. But since my wife calls it a sit n push toy, that’s what I am going to call it since she is always right. The reason the Uncle bought this toy was because it makes lots of noise, can cause lots of accidents, and is going to have your child begging you to push them everywhere. That can get annoying pretty quick. However, both my wife and I agree that every child should have some type of riding and pushing toy, and we have been very happy with this toy’s performance. I have no problem recommending this toy to adult looking for something special for a toddler they know. Kiddieland recommends this toy for children ages 12 months to 3 years and up. That is a very accurate age representation. Those are going to be the peak years for child enjoyment, but it might see a little playtime action in the following years. The train itself is a nice replica of Thomas, and there are actually 7 different buttons and controls you can push to make different noises. 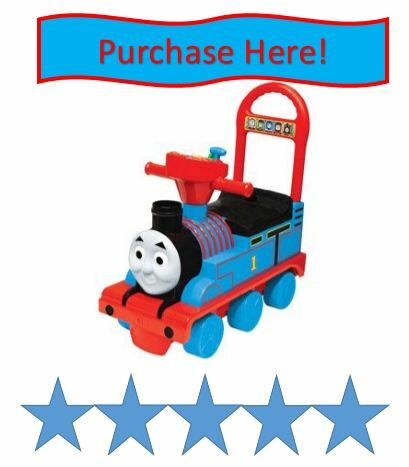 This makes the toy perfect for train fans or for Thomas fans. I believe it requires 2 AA batteries to operate. And as a nice change of pace they were included with the purchase. We have been playing with the toy for almost two years and still haven’t had to swap them out! My son really loves the fact that the seat lifts up and becomes a “hidden” storage compartment. He will store about 9 building blocks or a pile of toy tools in there. I have also found my keys, cell phone, television remote, and lots of food in it. As a parent if you are missing something small, this is a good place to check. The smoke stack also has an open top that he likes to put his binkies or blocks into. There are also a set of handle bars your child can hold onto, which is really important when they are being pushed around. The toy isn’t super tall, so children shouldn’t have any problem reaching the floor. When the physical skills allow, they will be able to push themselves all over the place. The only skill that takes a little while to master is the steering! There is also a really nice back part that helps keep your child from falling off the back and makes it easy for parents to push the toy around. The back part is high enough that I have no problem bending over and pushing him at almost 6 feet tall. It is easy on the back. The back part also allows your child to push the toy and run around with it. There are three wheels on each side that really help the toy move well on all types of flooring. It also makes the toy really stable. Adults that push the toy can really build up some good speed! My son loves riding on it by himself, being pushed by an adult, and he loves to just load up the train with other toys and push it around. There are lots of great things your kid can do with it, and it should bring a lot of enjoyment. 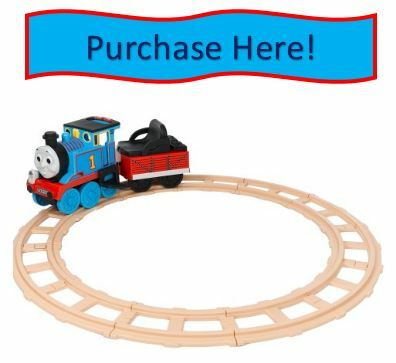 There are numerous other types of Thomas The Train riding toys avaliable as well – which are a great idea for any kid that is a fan of the show! This is the battery operated Thomas The Train that kids can ride on. It is recommended for children 18 months to 3 years and kids up to 45 pounds. Like usual, let’s take a look at the potential dangerous situations your children can get in. The most obvious situation you are going to have to deal with is train wrecks. Your child at some point will be running full speed and will crash the toy into furniture or a person. Hopefully they don’t crash it into anything that causes any discomfort. Your child will probably create a lot of those accidents on purpose. One of my son’s favorite activities is pushing his train really fast into his loaded dump truck. The other potential train wreck comes from an adult pushing the toy. Maybe the try to jump off while in motion, or you get going too fast and they fall off the side. Use your best judgment here, don’t go to fast if your child might attempt one of these stunts. Hopefully as parents we don’t purposely crash the train into things, but older siblings might take great enjoyment in causing wrecks by pushing their sibling into things. The unexpected danger situations actually comes from your child standing on the train. Our son does this in a number of different ways. Sometimes he just stands on it and jumps off because he thinks it is fun and he likes to jump off things. Sometimes he pushes the train to kitchen counters or the television stand so he can reach higher and try to grab things that are out of reach for a reason. Danger is twofold here, one your kid actually gets the things that were out of reach. Or two the train moves like it is suppose two, and your kid goes flying off. The train was not meant to be stood on. Especially with young boys, you might find an older brother encouraging a younger brother to stand on the toy and let them push them around. This is almost certainly going to lead to some type of bruising or scraping of the face. It is my parental duty to discourage this behavior even if it looks really really cool. There are some potentially dangerous situations here. So the best advice we can give you is to try and limit the potential danger. Because of our over active and clever son I have to give it a 6 out of 10 on the danger scale, but proper use greatly decreases the potential harm caused by Thomas the riding toy. This version apparently lets out steam from the smoke stack. There are a few things that may annoy parents about this toy. The biggest thing is going to be your child begging you to push them around everywhere and the potential temper tantrums that occur once you stop. The other thing that might annoy parents is all the sounds it makes. With 7 different buttons and switches, you will have plenty of sounds to pick from. There are 3 buttons that make the train say things like “hello, I’m Thomas” than his theme song plays. Or “thanks for helping me, it’s more fun with a friend” than a whistle blows. There is also a big button in the center that makes his face light up, he says all aboard, and the theme song plays again. Some of the other buttons and switches will make other train sounds like the engine revving up. Overall, there isn’t anything that will drive you completely crazy, unless you have watches the Thomas tv show numerous times and just can’t stand the theme song. Side note, our song has never actually watched that show, so that maybe why I’m not as bothered by the music. With all that being said this is a really good toy, but it can get more annoying overtime. I would give it a 6 out of 10 on the parent’s annoyance scale. This is a toy you are going to have to pay close attention to when your child is playing with it early on, but your child will have loads of fun with it. The pluses really outweigh the possible annoyance and dangerous situations you child could cause. If you need a push toy, or a riding toy, or whatever these things are actually called, this is a very good option. 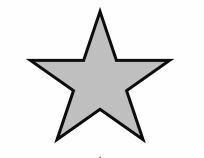 We give it a silver star rating, but honestly, it probably should be gold star!